Well, basically a long time ago back in junior school, me and my mate used to just do stupid noises that represented beatboxing. One day we decided to go onto the Internet and downloaded some Rahzel tunes. We just beatboxed and it came as like, "Ok then, got to get into that", so that really got me into full on proper beatboxing as I was just so interested with what he can do. Is that how you came across Humanbeatbox.com? Yeah, basically, once we searched for beatboxing, it came up with Humanbeatbox.com, so that’s how I found the site and I've been on that since February/March 2003. How did you get an alias as original and outstanding as Hobbit? Well, basically, it's kind of two little sides to it. One side's from my dad as it was his nickname and everyone called him it, and I though I'd just live it on in time, and my last name's Hobbs. Hobbs, Hobbit just kind of worked out well and it just stuck with me. It wasn't planned or anything, I wasn't going to have a ridiculous name or anything too extreme. Any plans for some CD releases in the future? Well, I’m working on some stuff with my band Shambles which is me, an MC, and a guitarist - which is acoustic hip-hop stuff, we like to call it 'hip hop for your mum' and that’s what were working on now and we're going to get some stuff done in a studio but me myself? Not as yet, but I want to produce some demo CDs to give you at gigs and stuff. What would you call your best performance and why was it so good? Hmm my best performance? I'd have to say Greenbelt. I've done it twice now - last year and just last August. Greenbelt is a hell of a gig to do. This year it was me, TyTe and Bevis; he did some collaborations and little solos. The crowd there was so lively and wanted to see this new art form - they were like, "Wow! What’s this? ", and then they come and watch it. You get such a good crowd response which is very good. So what’s your signature beat? I'd have to say that I'm well known for two of my beats - my laughing beat which kind of stunned me after I was experimenting with all sorts of rubbish, and it came about and now stuck with me in a strange way and also my echoed wind has come across from the beginning of the year. I did it at Make Some Noise and it's stuck with me since then. What is your unique sound and any tips on how it’s performed? 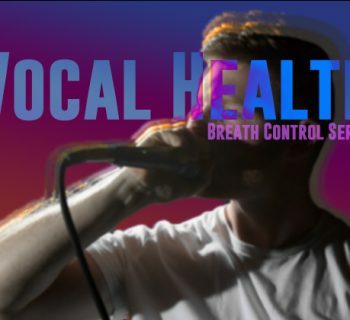 To be honest, a lot of my sounds are just basic beatboxing stuff, I mean, the only sound I'm really well know for are my stupid laughs and to them you'll have to work them out yourself! How did you come across this sound? At the end of 2004, Rahzel released his greatest knockouts CD which had a hell of a laughing beat on it and also back in the day, Biz Markie did a laugh and I just thought it'd be cool for me to do one of those and I used to do a stupid high pitched laugh and tried to incorporate it into a beat and then to make it a bit different I added the 'bowser' laugh off of Mario, and now they've been stuck into the same beat which I'm now known for. Not many people know that you became a Christian through the beatboxing community! How did this come about and why? Umm, well I became a Christian back in August last so that’s over a year ago now and it was through my girlfriend. I went randomly - i.e. my mum's going to church "shall we go?" It just came across and I became a Christian that day, but the year before, just before I went to an event called Cypher (which is a gathering of European Christian hip-hop artists and that really got me into wanting to be a Christian) and now I have done quite a few things with church to do with beatbox. I’m involved with the youth group and band. So yeah it came across well. What are people's responses when they hear you for the first time? Well, I think as any beatboxer can say (same as me), is like whenever you do beatboxing to someone who has never heard of it they will just go, "Hmm ok.", then "Do that again!" 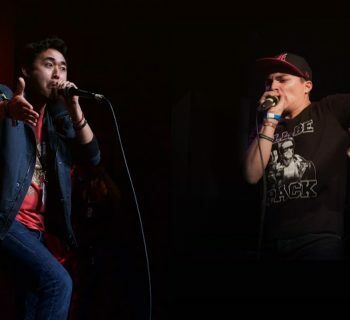 It is always a 'wow' factor with beatboxing you know? You can always do it whenever you want, to anyone, and they're just like you, like "Yeah…cool!" Any advice to people just starting out? Ah, always to newbies - you've always got to stick to it. I know you’ll be there listening to clips saying or trying to do it and its nothing like what they do, but just stick it! I mean, I have clips of me from back in 2002/03 and they're nothing compared to now, and it’s like how much progression has been. You've just got to keep producing those beats and keep at it. So how about a sneak peak of any beats you have under the cover? Just a new question after seeing that! Can you explain why when people beatbox they use their hands so vividly? Arh, I can’t explain it! I mean it’s something that comes with the form you know? I mean, you always do it like with guitars, obviously because they got a guitar, but you're almost acting as if you're, I don’t know, kind of like a DJ thing you got where your doing this and keeping the beat with your hands, like Kenny Muhammad is always keeping the beat with his hand. It just depends. I keep the beat with my whole body and everything - it’s just to keep the beat basically. Would you call it more to keep the stage presence alive? Yeah, you could say that actually. In a lot of gigs, I mean, you get the beatboxers that stand there with there hood up over there head, just standing on stage and they won't move. And then you get some people like Shlomo, Killa Kela, and people like that, who are on stage and run around and pointing and everything and they really interact with the crowd well - which I think is a good thing when beatboxing - to interact with the crowd and get the audience involved and not just stand there and the audience to be, "Yeah this is good, but it’s getting a bit boring because what is he doing on stage." Oooh, got to always go with the Mars. Hmmm, that’s a hard one, got to go with the vocals though. Girls Aloud or Liberty X? Argh, they’re both rubbish! Umm, Liberty X had one good tune I liked, Girls Aloud just... no. Ah, main shout out to Humanbeatbox.com, the number one beatboxing site on the Internet! Everyone’s got to get into this! Everyone who sees this has got to get into beatboxing - it’s the best. Also, a big shout to Mr. Gavin TyTe, one of my main inspirations, and just basically everyone from Humanbeatbox.com. Big Up Yourself! Yeah my Web site. 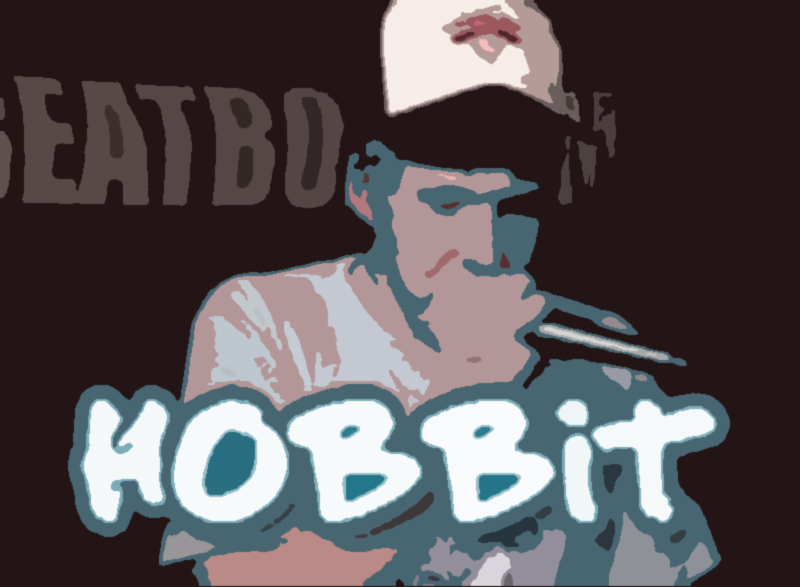 Visit me at Hobbitbeats.co.uk, Peace!